The CoffeeShop Blog: CoffeeShop Express Eye Bright PSE/Photoshop Action! CoffeeShop Express Eye Bright PSE/Photoshop Action! If you are new to my blog, welcome!!! The CoffeeShop Blog is a one-woman-owned business (by me, Rita!) and I create all of the tutorials and freebies posted here. If you want to grab hundreds of my Photoshop/PSE actions (including exclusive sets not found here on my blog), Lightroom Presets, and professional digital designs (including all of my favorite holiday sets) in a single download AND support my site please check out my CoffeeShop Download Pack. I appreciate your support!!! Thanks to you The CoffeeShop Blog is possible. I have a personal goal of posting a free action here every week in May. Today I was frantically working on the computer while Duke was doing his math downstairs and Imp was playing in my "office" with me. We went to the circus this weekend so he was doing some "circus tricks" to impress me. He kept on saying "Mommy, look over here" and I would glance over, distracted, and say "Wow, that is neat" and go back to work. I have a huge pile of really amazing actions that I need to finalize and post, but I decided to release this practical one today. CoffeeShop Express Eye Bright is perfect for a quick eye enhancement. Simply click on the background layer (or the layer with the eyes you want to sharpen), run the action, and paint on the layer mask to sharpen and brighten the eyes. If you want more control please check out CoffeeShop Eye Bright. 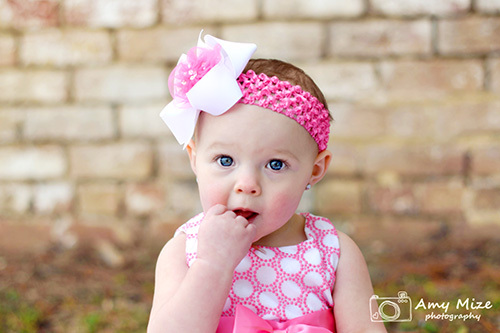 I am using a beautiful image from Amy Mize Photography for this tutorial. I ran my Dandelion Wine action on the image, and then clicked on the background and ran Express Eye Bright. 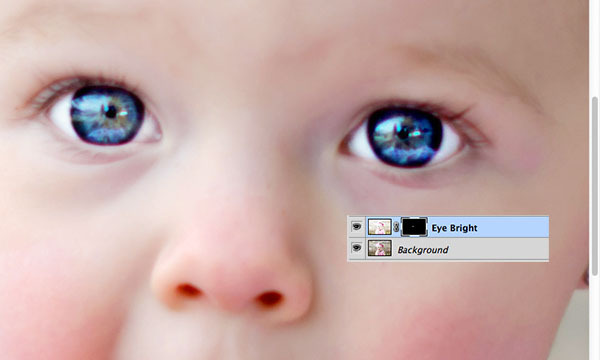 Zoom in on the eyes and use a soft white brush at 100% opacity to brush over the pupils and whites. The eyes will look freaky, but don't worry. Mouse over to see the before (does not work on phones). 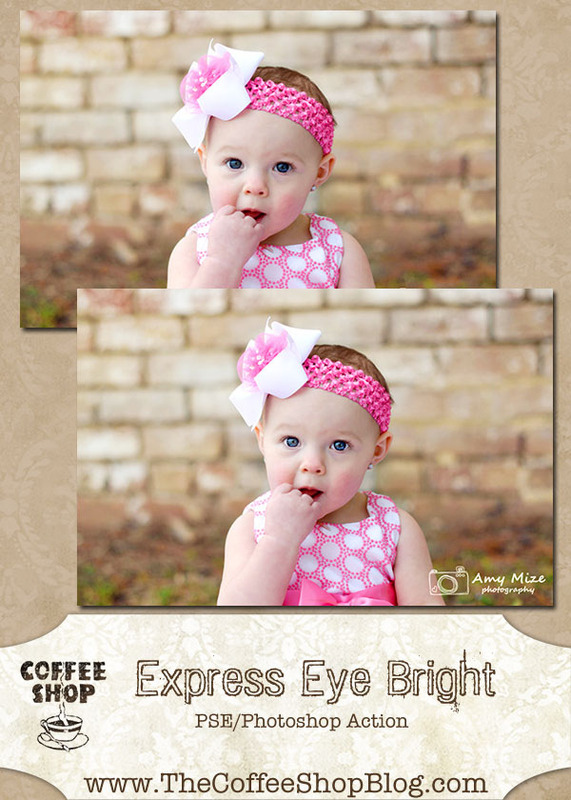 Download the free CoffeeShop Express Eye Bright action. You can also download it here. As always, I love your actions! And ...... your giving spirit :) Thank you so much. Wonderful! Thank you for adding the "alien-eyes" warning. 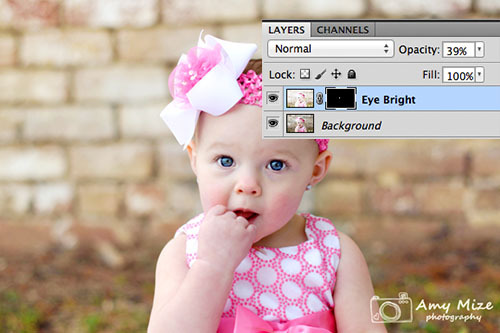 Over-processed eyes are a serious pet-peeve of mine... it speaks of "Faux-tographer" to me. All the same, sometimes you really want people to feel that connection with your subject and brightening the eyes (done well) can make that happen. Thank you thank you thank you! For some reason your other bright eye action doesn't work right with my PSE11 software, but this one downloaded perfectly. Love all your actions, you do such amazing work! So glad to see this action on here! Thanks! Hey! Running cs6 and this action isnt working for me...saying layer one can't load. Any tips? Thanks!!! Oh yes please!! This action is awesome. I've been using the long version of Eye Bright and this condensed all in one version is saving me heaps of time. I've written in a Flatten layers step before it starts and a step to set the opacity at the end so all I need to do is mask. Thanks so much!! Thanks so much for this. I'm a photoshop newbie, so this is wonderful and so easy to use! For those of us who are less knowledgable in maneuvering in photoshop, thank you so much for helping to complete tasks that otherwise we would still be wondering around in the program trying to figure out. You are a saint! Definitely believe that which you stated. Your favourite justification seemed to be at the web the easiest factor to be aware of. think about concerns that they just don't recognise about. having side effect , folks could take a signal. Will likely be back to get more.